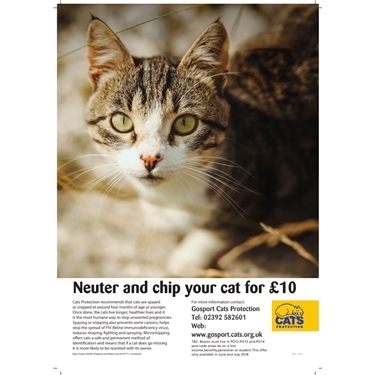 There's still time to get your cat booked in for the £10 snip & chip offer from Gosport Cats Protection which runds until the end of July. The £10 offer is open to owners in the PO12, PO13 and PO14 postcode areas and under the campaign you could get your pet cat neutered and microchipped for £10. Kittens can be neutered from 4 months of age and older cats can also be done so this is a great time to help your cat be healthier and safer. The £10 offer is on until 31/07/18 so owners on benefits, a low income, students, pensioners or if you’d struggle to pay for neutering and microchipping, should ring 02392 582601 during July to make sure you don’t miss out on the offer. Your pet’s surgery needs to be booked with the vet by 31/07/18 - though the operation itself can be in August. Calls being taken every day, including Saturday & Sunday so don't delay and ring today. We want to help as many cats and owners as possible so do phone us for more details and to register your pet cat(s) for the £10 offer.